UPDATED: Stunning New Images of the 'PROMETHEUS' Revealed in Ridley Scott's Epic Sci-Fi Behemoth! The promotional campaign for Ridley Scott's Prometheus continues to build momentum. 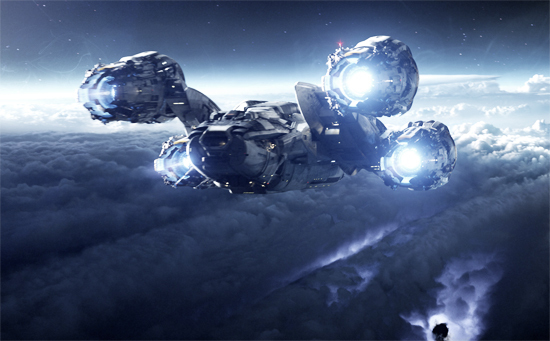 20th Century Fox have revealed a beautiful new shot of the breathtaking spaceship Prometheus from the movie. The image was unlocked at Fox's site ProjectPrometheus.com. To gain access to image, fans had to add Eridu to the URL, ergo ProjectPrometheus.com/Eridu, then for the password you can use tell abu shahrain. Whats the connection? Hit the jump for the details. Prometheus stars Noomi Rapace, Michael Fassbender, Charlize Theron, Idris Elba, Sean Harris, Kate Dickie, Rafe Spall, Logan Marshall-Green & Guy Pearce. Prometheus arrives June 1st in the UK & June 8th in the US. Updated with second image. According to Wikipedia, "Eridu is an ancient Sumerian city in what is now Tell Abu Shahrain, Dhi Qar Governorate, Iraq." Update: Second image unlocked by using the following password: 'DDM2DDM2DDM2AMAMAMBIGBIGBIGBMESMPP'. Click on Image to view full size. Will continue to update with images as revealed. 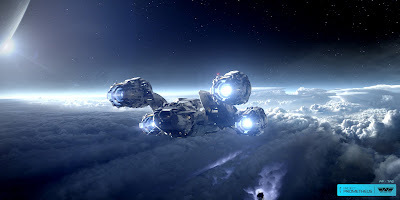 I'm reading: UPDATED: Stunning New Images of the 'PROMETHEUS' Revealed in Ridley Scott's Epic Sci-Fi Behemoth!Tweet this!